Thai artist Natee Utarit examines the practice of painting, questioning western traditions of painting, set against commentaries of Thai society and identity. Spanning 4 sections, Painting as Narrative, Painting about Paintings, Painting after Photography, Beginning After Painting, this large body of work will impress. In the footsteps of Gerhard Richter, Natee Utarit’s work engages with painting beyond its use as a medium. It is also the subject of his adulation and critique. The 4 sections are expected: an artist trained in the academy style will naturally conform and rebel to Western painterly traditions. Photography, entrenched as a tool for remembering, is also a tool and subject to the artist. It is used by the artist to construct compositions, document completed paintings and as a means to communicate expectations. By including photographs of what the galleries in this exhibition look like, I am telling you what to expect. By ‘beginning after painting’, suggest Utarit establishing his own style of painting amongst the various discourses, intellectual or bickering, on the relevance of painting in art. To further value and evaluate Utarit’s work, we may use the notion of still life – both in the genre of Western Still Life traditions, but also in their conveyance of paralysis and stasis. The genre of Still Life suggests allegories, naturalistic renditions conveying meaning other than the literal. A dutch painting from the 17th century, might use oranges to symbolise wealth because oranges then, were rare. 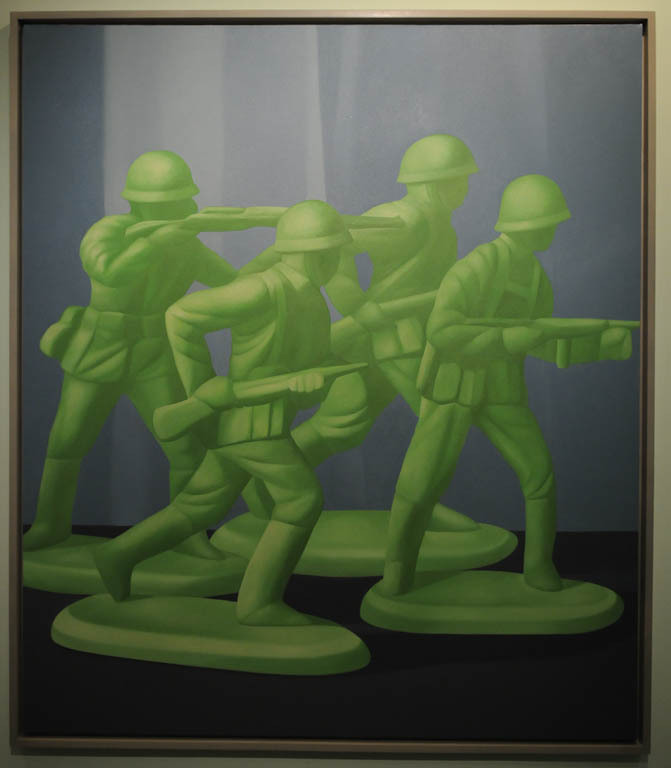 In Natee Utarit’s painting of plastic American toy soldiers, they may yet symbolise the play between the military and politics, and the coup that overthrew Thaksin’s government. 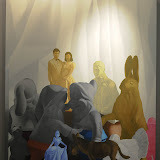 Besides using inanimate objects such as flowers and toys, the later paintings are largely constructed from references of carefully positioned images upon images. What is remarkable of Natee Utarit’s body of work is the breadth and variety of subject matter he works with. His paintings are resolute and decisive, fashionable with the use of plain backgrounds to contrast the only subject matter of the painting in the foreground. The overly static composition may leave too much room for contemplation, and little action in the foreground. What will be exciting to see next is ‘After Still-ness’, where the allegories could be taken to a new classical level, or a different romanticised level by including a larger presence of people in more dramatic movement and colour.